- Weekly planetary positions from the Sun to Pluto, Lunar nodes, Dark Moon (true calculation). - Monthly positions of planetoids Chiron, Ceres, Junon, Pallas, Vesta, Sedna and also the Mean Dark Moon. - Planetary stations with dates and longitudes of direct and retrograde stations. - Moon phases with dates, times and lunar longitudes for the 4 phases. These data are supplemented with the graphical representation of planetary motions on the zodiac. 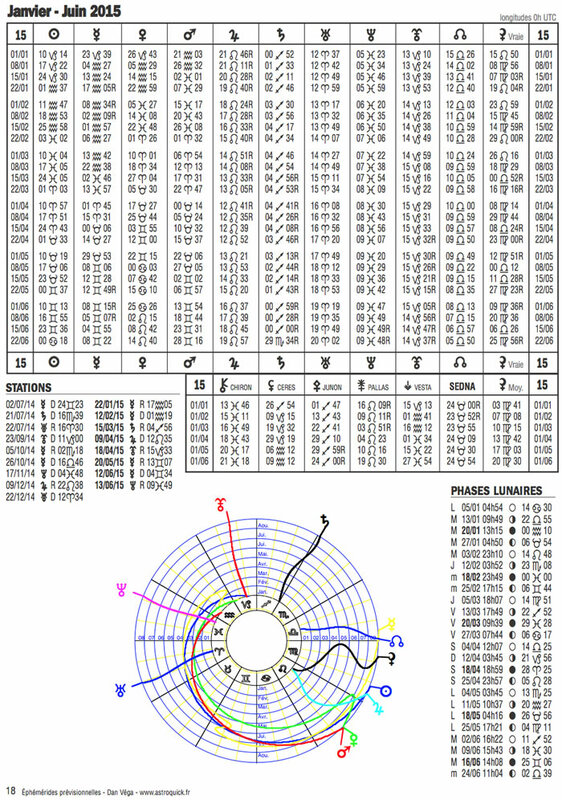 The positions are given in longitude on the tropical zodiac for 0h UT (Universal Time). It's the perfect book for dating and determination transits multiple passes with their direct and retrograde phases. A5 PDF document - 32 pages.